Updated at 12:03 a.m. on Thursday, July 19, 2018. Lakeview's head coach Jerry Jones reacts to a official's call. The Lakeview-Fort Oglethrope Warriors faced the Murray County Indians in GHSA District 6-AAA basketball tournament at Ringgold High School, February 10, 2016. In the end, Jerry Jones finally listened to his body. 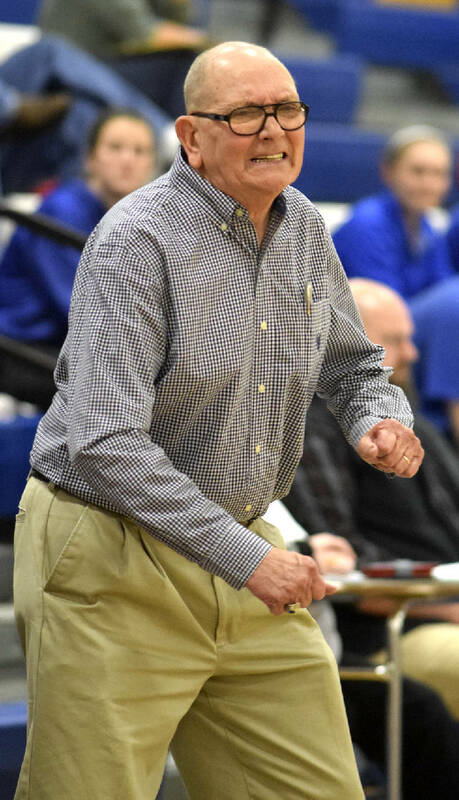 The veteran high school basketball coach — despite his inner intuition — announced his retirement Wednesday afternoon after 52 seasons, most spent in Catoosa County at Ringgold and most recently Lakeview-Fort Oglethorpe. Jones, 75, directed more than 600 wins and affected the lives of hundreds of students. The retirement, he said, is due to health issues that have intensified the past few weeks. "I said I would never say the 'R' word, but I am officially retiring as of today," Jones said from a hospital room at Erlanger East. "At my age you have to take care of your health first. I hate to do it, but I don't think I can give it 100 percent mentally and physically like I have for the past 52 years. "It's hard to give up something that's been such a big part of your life." Jones has been hospitalized for heart-related issues and says he likely will need surgery to correct the problem. With the start of school looming he felt it owed the LFO administration time to find a successor. "I don't want to hold them off any longer, because school starts soon," he said. "It's time somebody else has a shot at it." Jones overcame another serious health scare in 2014 after suffering complications following prostate surgery. The Jones family at the time was told to expect the worst, but the patriarch of a basketball family that includes former players Steve and J.R. (currently the principal at Ringgold High School) fought his way out of the hospital and back onto the court that was officially named after him in 2010. Jones, a 1961 Dalton High School graduate, had two stints at Ringgold and LFO in addition to stops at Jordan High School in Columbus, Westside High School in Macon, Northwest Whitfield and North Georgia Christian School. The 31 total years he spent at LFO were the most at one school, and though recent seasons have been short in the win column (28 in the past four seasons), Jones feels his legacy will be about more than wins and losses. "Counting Lakeview and Ringgold I've had around 600 wins — but we had a lot of losses in the last few years," he laughed. "I feel we held our own, though, for the most part. I hope my teams will always be remembered for how hard they played." Attempts to reach LFO athletic director Chris Eaves were unsuccessful Wednesday. Jones, though, believes the program is in good shape. "There are a couple of people behind me who can take over and do a good job," he said. "LFO has some potential. I know the facilities are as good as any around, and the administration is wonderful." Jones said he hopes to remain a part of the LFO athletic program in the future. He knows the students returning to the Warriors this year understand how much they mean to him. "I told them last year that I won't ever leave you — I might just be up in the bleachers watching," he said. "I do hope once I get back on my feet that I can enjoy it more, and I hope to still be able to work with the athletic program when my health improves."